GET YOUR COMPANY REGISTERED IN 24 HOURS ANYWHERE IN SOUTH AFRICA! We can register a company (PTY – NPC – NPO – INCOR – CO-OP’S - NHBRC- CIDB – PSIRA - PISRB – NCR) anywhere in South Africa. Just send us an email and we will send you the requirements. 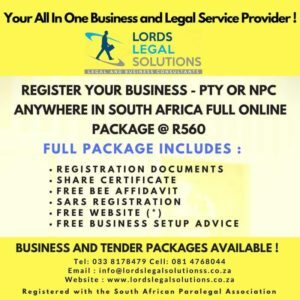 Lords Legal Solutions has registered more than 5 000 Startup Businesses in 2017 across South Africa. We are regarded as business experts that offer a multiple platform of services to our clients. This includes services in the following sectors : Legal , Business , Accounting / Tax and HR / Payroll sectors . 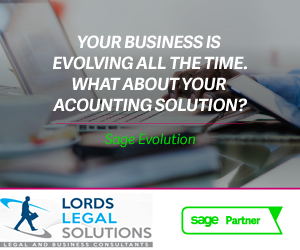 Contact us for all your Sage Pastel Software and Solutions . We will assist your with tailor made packages to get your business to the next level. We can register and give you professional advice on what business platform to register your entity. We also assist further with all your CIPC amendments / returns etc. We can assist you with all your Bookkeeping and Tax needs . We have the latest integrated software that can give you accurate feedback regarding your companies financial health and assist you in maintaining a healthy profit gain going forward. Lords Legal Solutions can assist you with all your legal requirements . Our professionals are experts in the following facets of law : Litigation , Corporate , Commercial , Banking , Property and Insolvent Estates and Contract Law . Contact us today and our professionals will create a tailor made and affordable package to assist you. Lords Legal Solutions are governed by many legal bodies that govern our ethics, code of conduct and business ethos towards our clients. Our professionals can assist you anywhere countrywide with expert business tailor made solutions and support . Our services and offerings are affordable to our clients as we want to see them propser in their business going forward.